Sunday we took our bikes to Angel Island for a ride just under 10 miles long. We left early morning to drive to Tiburon and then caught the ferry to the island. We took the perimeter (paved) road around clockwise so we could hop onto the inner road early in the trip. It was a decent climb to a dirt fire road that loops around the inner part of the island. After completing that loop we dropped back down to the perimeter road and completed that. This is easily one of the most scenic bike rides I've done. 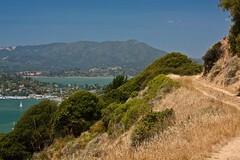 No matter where you were on the trail there was a view of the bay. The weather was perfect. It was a great day. There was a few tourists there but they all pretty much stayed on the perimeter road. We took our time on the trails and took a ton of photos. By the time we got back to Tiburon the tourist rush was gone and getting a shady patio seat at a restaurant there was extremely easy.